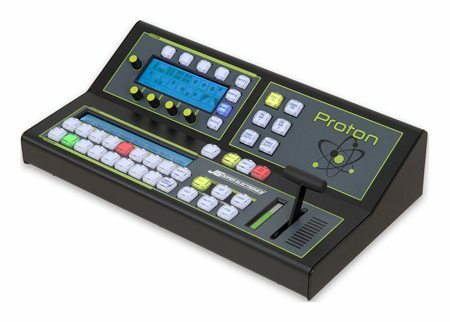 Compact, low-cost video switcher control surface for live video production; provides hardware-based control of all recent Blackmagic Design ATEM Live Production Switchers, including 4K variants. Ideal for live production at music festivals, sports events, AV presentations, lecture theatres, Houses of Worship, etc. 240 x 96 pixel backlit LCD screen with rotary encoders for system and macro setup, wipe selection, etc. Control of switchers in both live and off-line environments is best conducted from a dedicated hardware control surface rather than the mouse/software screen combination offered as standard. 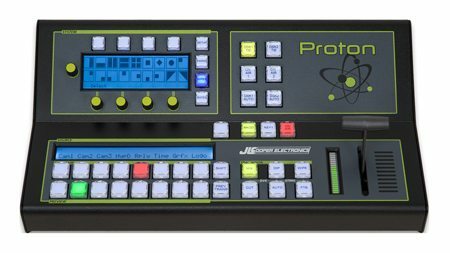 The JLCooper Proton is a lower cost alternative to other hardware controllers which may be unnecessarily complex for simpler switching tasks. 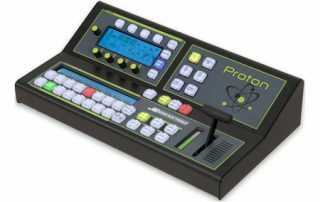 The Proton interfaces directly with the Blackmagic Design ATEM range of switchers via a single Ethernet connection. (A computer or Blackmagic Broadcast Panel running ATEM Software Control may remain connected by using an simple Ethernet switch.) Almost every ATEM function and parameter is rapidly accessible from the Proton, including source selection, wipes, dissolves, cuts and fade-to-black. ATEM models with which the Proton is directly compatible include the ATEM 2 M/E Broadcast Studio 4K, ATEM 1 and 2 M/E Production Studio 4K, ATEM 1 and 2 M/E Production Switcher and ATEM Television Studio. The controller is an elegant and compact unit, small enough to be fitted to a rack shelf if necessary. All push-buttons are large and illuminated and may have their legends customised to suit individual requirements. The brightness of both button illumination and the LCD displays is also user-adjustable, making the Proton suitable for use with low ambient lighting. Program and Preview buses each have eight buttons for source selection – External 1-6 plus black and colour bars; the source labels appear automatically in the 2 x 40-character LCD Source Names Display immediately above the bus switch bank. A SHIFT key accesses a further eight sources, the choice varying slightly with the ATEM system in use. The buttons automatically remap to match the number of inputs available in the switcher. Further buttons select cut, wipe, mix or dip transitions, which may be actioned either manually with the precision T-bar, or automatically using the AUTO button. Dip rate is user-definable. The T-bar has an associated LED progress bargraph. DVE and Stinger transitions are also available with ATEM switchers that support them. Transitions may also be previewed using the PREV TRANS button. The upper part of the controller surface includes a 240 x 96 pixel LCD screen for displaying the wipe options, for entering transition rates, system setup parameters, keyer and audio parameters and macro definitions. When in use with switchers equipped with Auxiliary Outputs, these outputs may also be controlled from the graphics screen. Six further buttons support comprehensive use of one Upstream and two Downstream Key sources. In addition, keyer parameters may be set up from the graphics screen. Four Macro keys allow a sequence of button presses to be stored, so that a frequently repeated action can be executed with a single button press. An Aux Input on the rear panel is provided for the future connection of controller expansion modules. The Proton can be switched into one of two “Host Modes”, where the controller outputs a greatly simplified control protocol; the displays also respond to a similarly reduced command set. This allows software developers to integrate the Proton into switcher systems from other manufacturers. The Proton is fitted with an internal Universal PSU, avoiding the use of external DC power adaptors. The mains input connection is via a standard IEC socket and a power switch on the rear panel.